From Friday, February 10-Sunday, February 12, 106 teens representing 16 congregations across the Mid-South District gathered at Mt. 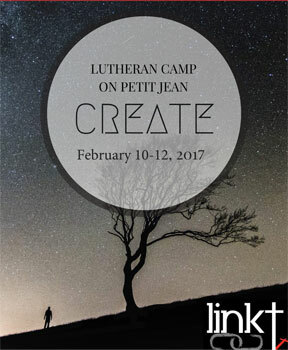 Petit Jean Lutheran Camp in Arkansas for the LinkT Mid-Winter Retreat for senior youth. The weekend’s activities were built around the theme “Create,” culminating with a moving talk by David Youman from Concordia University in Austin, Texas. It was a great weekend of worship and fellowship, punctuated by unseasonably warm and beautiful weather! Many thanks go to all who attended and those who worked to put it all together.